The night skies are waiting for you at the Ashton Observatory! 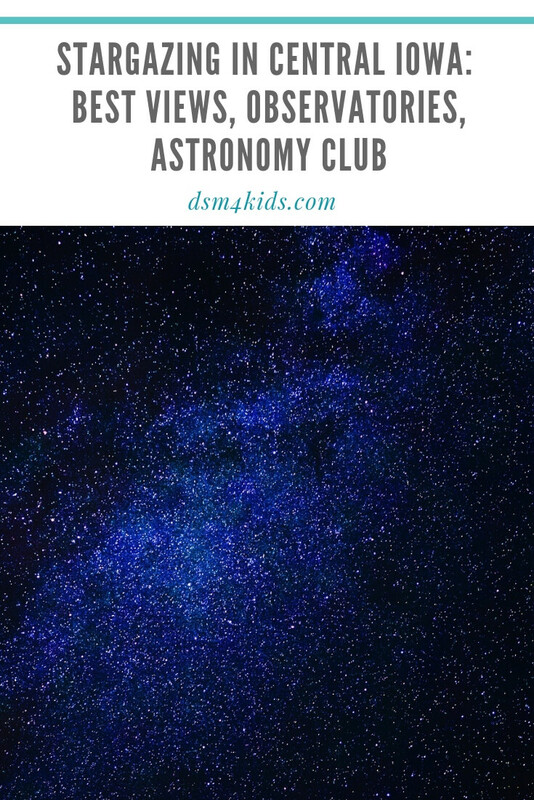 The Des Moines Astronomical Society is a non-profit organization dedicated to educating the general public about astronomy and astrophysics. The club operates the Ashton Observatory in Ashton-Wildwood Park in Jasper County. The observatory features two 16 inch diameter telescopes and a classroom. DMAS offers FREE Public Night events at the Observatory every Saturday evening, April through October. (Except for first Saturdays of each month.) Evenings begin with a classroom program at 8:00 pm and opportunities to view the night sky once it’s dark. You can also schedule private group visits for a small fee. It’s about a 30 minute drive from Des Moines to the Ashton Observatory, be sure to contact DMAS or watch their Facebook Page to confirm there that there will be a Public Night viewing. The Brenton Arboretum is in rural Dallas County and is a special type of public garden dedicated to trees and shrubs. Admission to the Arboretum is FREE and families are welcome to visit during their regular hours, 9:00 am to sunset daily. Families can stargaze any time at the Arboretum on their own. The Arboretum will be hosting a Full Moon Hike on June 15, 2019 from 9:00 to 11:00 pm. Take a brisk guided hike through moonlit meadows and woods. You will learn about various points of interest and seasonal highlights at the Arboretum during this 2-3 mile hike. Appropriate for ages 16+. Registration required. $5 for non-members, $2 for members. The Observatory is operated jointly by the City of Des Moines and Drake University. The building contains an eight and a half inch refracting telescope, which was built in 1894 and donated to Drake University by Francis Marion Drake. Drake Municipal Observatory is located on the grounds of Waveland Golf Course and is open to the public during Public Night, a series held during the spring, summer and fall on Friday nights. 2019 is the 50th Anniversary of Man’s first steps on another world. In Celebration of Man’s first steps, the 2019 Lecture Series will present man’s exploration of our solar system and beyond. The spring Series “Exploration by Proxy” will present man’s first attempts at space exploration. Summer series “Sp’am In A Can” will outline our quest to land a man on the moon. The fall series “Beyond The Horizon. the First Step” will outline the possible futures of manned space travel to “where no one has gone before”. Lectures begin at 8:00 pm and skyviewing begins at dark, if the weather is clear. This series is FREE and open to the public. Explore the solar system at the Science Center of Iowa’s Why the Sky? Exhibit and enjoy a show in the Planetarium. Families can also attend one of the Center’s FREE Star Parties for some after-hours fun. SCI staff and members of the Des Moines Astronomical Society will set up telescopes on the south side of the Science Center, at Ewing Park in conjunction with Des Moines Park and Recreation or at Ashton Observatory. Please note Star Parties are weather dependent and are subject to cancellation. Check SCI’s Facebook page for updates on the event. This Polk county park has a campground, two picnic shelters, universally designed play area, fishing pond, and the 1-1/2 mile Devotie Trail. The park entrance is located on NE 108th Street just south of NE 46th Street between Altoona and Mitchellville. Summer hours are from 6:30 am to 10:30 pm. On August 12, 2019 at 8:30 pm learn all about asteroids, meteors, and meteorites at the park during a Meteor Shower Watch. Plan to spend your time gazing up at the night sky for the Perseids meteor shower, as well as the moon and any stars out this night. Hosted by Polk County Conservation. No registration required. FREE. Whiterock Conservancy is about an hour and 20-minute drive from Des Moines and has some of the darkest skies in Iowa. Find a quiet hill and look up to take in the spring or summer night sky, the myriad of stars never fail to please. Weather you have a telescope or not, the Milky Way can be seen by the naked eye most nights. The public is invited to join the Conservancy’s Star Party Public Viewing Night on Friday, August 30, 2019 at 7:30 to 10:00 pm. If you have a passion for the stars in sky and the mysteries that they hold, then, you’ll enjoy a night of looking at the dark sky through telescopes set up by the Ames Area Amateur Astronomers. Bring your friends and family to be entertained by a starry night. Does your family go stargazing in Central Iowa? What’s your favorite spot? Tell us about it in the comments section.